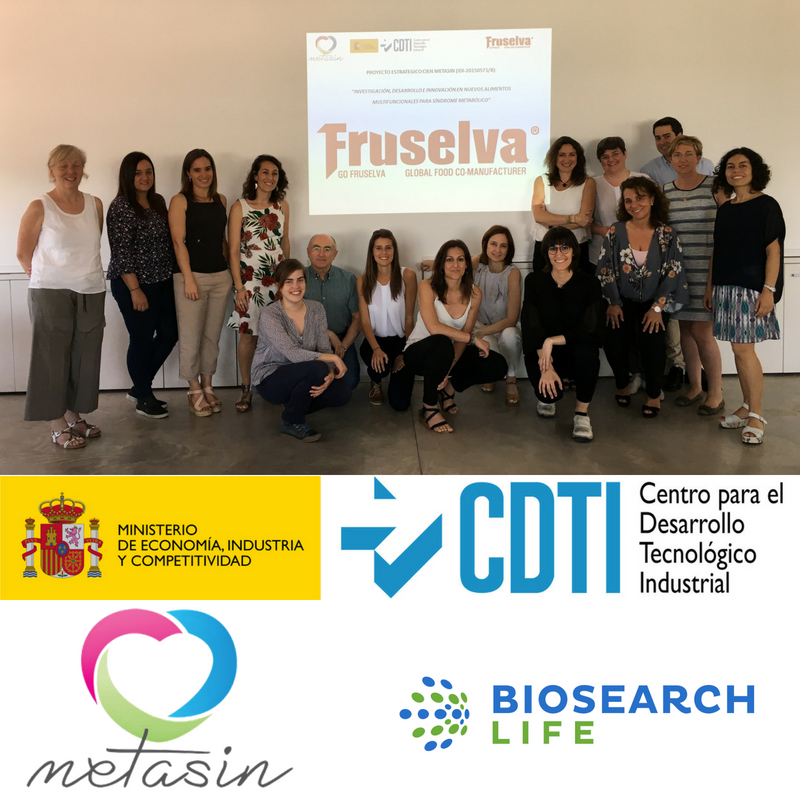 Last Thursday, on June 21, the 5th follow-up meeting of the METASIN project, approved in the 2015 call of the CIEN strategic programme, funded by the CDTI, took place at the Go Fruselva, SL facilities (La Selva del Camp, Tarragona). Only 6 months after finalisation of the project, the success of the companies participating in the achievement of the proposed objectives has been confirmed: research, development and the market launch of new active ingredients, foods or multifunctional food supplements, scientifically supported and capable of having an impact on the pathologies and risk factors associated with the metabolic syndrome. Once again, the effective collaboration among the different members of the consortium has been demonstrated, taking advantage of the synergies and complementarity existing between the companies developing natural ingredients and those of the final product. The main ingredients studied in the framework of this project are microalgae, probiotics, β-glucans, omega 3, cereal seeds, fibres, phytosterols, vitamins and minerals, which have been incorporated into food categories such as juices, smoothies, soft drinks, fruit and vegetable purees, dairy products, gelatines, bars, pancakes, sauces, confectionery and meat products. Currently, two of the prototypes designed are being marketed: a light sauce with fibre and quinoa, developed by Acesur and Oatmeal pancakes and rice with seaweed, fruit of the collaboration between Galletas Gullón and Algaenergy. On the other hand, in relation to the activities carried out by Biosearch Life in this project, it is worth mentioning that the company has obtained a new collection of probiotic strains, isolated from breast milk, with which numerous tests are being carried out for selecting active bacteria against Metabolic Syndrome. Some of them are already in the clinical validation phase. Furthermore, a new European and international patent application has been presented to protect the promising results obtained in the nutritional intervention study, carried out on women with fertility problems associated with Polycystic Ovarian Syndrome (PCOS), a complex and heterogeneous disease where gynaecological alterations coexist with metabolic problems such as insulin resistance, a feature of Metabolic Syndrome. All this is a clear example of the commitment of the companies in the METASIN consortium (BIOSEARCH, SA (coordinator), ACEITES DEL SUR-COOSUR, SA, ALGAENERGY, SA, CREACIONES AROMÁTICAS INDUSTRIALES, SA (CARINSA), FEIRACO LÁCTEOS, SL, GO FRUSELVA , SL, MAHOU, SA, and VIDA, a company that belongs to Galletas Gullón, SA), for the improvement and maintenance of health through diet and food supplements.